Your alignment is your character's personal beliefs and outlook on life. You range from Chaos to Unity, and from Good to Evil. This can be imagined as a graph with two axes: one for Chaos/Unity, and one for Good/Evil. 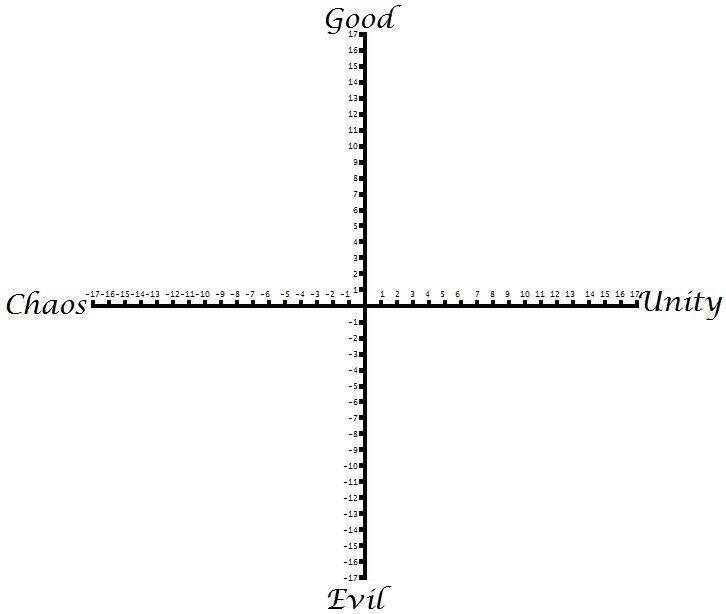 Your character starts Neutral, at the center of the graph with an alignment of (0,0). As you become more Unity-aligned, the first number increases, and as you become more Chaos-aligned, the first number decreases. As you become more Good-aligned, the second number increases, and as you become more Evil-aligned, the second number decreases. 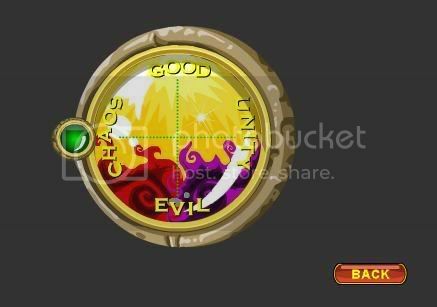 You can check your alignment by talking to Twilly, and asking to see your moral compass. This won't give you a number (unless you zoom in and count the dots), but it gives you a good idea of where you are. (+6,0) means that you are Aligned to Unity, and (-6,0) means that you are Aligned to Chaos. Likewise, (0,+6) means that you are Aligned to Good and (0,-6) means that you are Aligned to Evil. The two numbers have no effect on each other. You can be Chaos-Good with (-6,+6), Unity-Good with (+6,+6), or anywhere in between. Certain quests give you options, and your choice changes your alignment. When you choose, your alignment shifts one point in that direction. Alignments can go to ±17, but currently they have a maximum of +6 and a minimum of -6. However, The Beginning of The End can get your Chaos/Unity Alignment to ±7 if you are currently at ±6. ****1) Affects Chaos/Unity Alignment, or no change. ****1) Affects Good/Evil Alignment, or no change. ****1) Affects Evil Alignment, or no change.